Antique County Outline of the United States American Map Co. This is a wood engraving from Ballou’s Monthly Magazine published in 1888. First settled by the Polynesians sailing from other Pacific islands between 300 and 600 AD who called the islands Hawaii. In 1778, British Explorer Captain James Cook visited and called the island group the Sandwich Islands. The map measures 6.5″ x 8.5″. 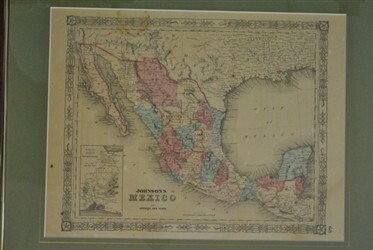 The map framed measures overall 14.5″ x 16″. This is a great map, beautifully matted and framed. We have the authenticity papers. ORIGINAL FIRST ISSUE of LIFE Magazine. November 23, 1936, Fort Peck Dam, Montana Cover taken by Margaret Bourke-White. Photos by Margaret Bourke-White, Alfred Eisenstaedt, Thos. D. McAvoy, Peter Stackpole Art: Artist John Steuart Curry of Kansas, complete with 5 great large color illustrations of his paintings. Franklin Roosevelt’s Wild West Chinatown School Fort Knox Cheerleaders War Stories Movie:”Camille” Russia Gooney Golf Hollywood parties Picture: Fort Belvedere Pictorial: Brazil NBC Radio Studios, “… Celebrating 10th birthday last week” Pictorial Profile: Helen Hayes Montana Relief Workers daily life .. Vintage Ads, full page color ads for General Motors Cars, a double-page full color ad for Chessie – the Chesapeake and Ohio Railroad, and other great 30’s industry and product ads. Picturesque America is a two-volume set of books describing and illustrating the sites of America, published by D. Appleton and Company of New York in 1872 and 1874, it was edited by William Cullen Bryant. The work’s essays together with its nine hundred wood engravings and fifty steel engravings, are considered to have had a profound influence on the growth of tourism and the historic preservation movement in the United States. This two-volume set and others of the same genre, achieved great popularity in the nineteenth century. Their illustrations provided a tour of nineteenth century America. The volumes display both steel and wood engravings based on the paintings of some of the best American landscape painters of the nineteenth century, such as John Frederick Kensett, William Stanley Haseltine, James David Smillie, John William Casilear, Thomas Moran, A. C. Warren, Harry Fenn, David Johnson, Granville Perkins, John Douglas Woodward (1846-1924), Felix Octavius Carr Darley, Albert Fitch Bellows, James McDougal Hart, Casimir Clayton Griswold (1834-1918), Worthington Whittredge, Charles G. Rosenberg (1818 – 1879), William Ludwell Sheppard (1833-1912), Homer Dodge Martin, Alfred Rudolph Waud, William Hart, Robert Swain Gifford, Jules Tavernier, William Hamilton Gibson, Thomas Cole and others. Original copy of the New York American Journal from Friday November, 22 1963. It has a large printed title:” Kennedy Extra, President Dead, Shot by Assassin”. There is a large center shot of the presidents wife leaning over him in the car. Included with this period newspaper is a full page color photo by Daniel Jacino and Arther Sasse from the Sunday News of the Late President John F. Kennedy. We are delighted to present these original and signed official paperwork from the late 1700’s and early 1800’s. These came from a serious collector’s estate. These are a wonderful investment, and are prefect for the home, office, gallery, museum, or as a gift. Land Grant signed by Georgia Governor Edward Telfair. Edward Telfair (1735-September 17, 1807) was the 19th Governor of the state of Georgia in 1786 and 1790-1793. He was born in Town Head, Scotland, and graduated from the Kirkcudbright Grammar School then acquired a thorough commercial training. He immigrated to the United States in 1758 as agent of a commercial house and settled in Virginia. He moved to Halifax, North Carolina and then established a commission house in Savannah, Georgia in 1766. Telfair was a member of the council of safety in 1775 and 1776, and a delegate to the Provincial Congress at Savannah in 1776; member of the committee of intelligence and other important committees in 1776. Telfair was a member of the Continental Congress for 1778, 1780, 1781, and 1782. He was one of the signers of the Articles of Confederation and a delegate to the State ratification convention. In 1783, he was commissioner to treat with the Cherokee Indians. Telfair was also designated agent on the part of Georgia to settle the northern boundary of the Commonwealth in February 1783, and eventually Governor of Georgia. Later, Telfair was one of only 10 men who received electoral votes during the first election for President and Vice President of the United States, receiving the vote of an unrecorded elector from his home state of Georgia. He died in Savannah, Georgia, and was buried in the Bonaventure Cemetery there. His son, Thomas Telfair, represented Georgia in the U.S. Congress. Georgia named Telfair County in his honor. The official document is partly printed on vellum, a land grant for 1000 acres, dated June 6, 1793. Also included is the original top of the wax seal that was used to stamp the land grant. It is framed and matted under glass on both sides. In great condition. The measurements including the frame is 19.5″W x 22″H. Land Grant signed by Georgia Governor William Schley. Schley was born in Frederick, Maryland, and moved to Augusta, Georgia, in the early 19th century. He was educated at the academies of Louisville and Augusta, Georgia, studied law, and was admitted to the bar in 1812. He then practiced law in Augusta. From 1825 through 1828 he was a Superior Court judge of the Middle District in Georgia. In 1830 he became a member of the Georgia House of Representatives. In 1832 and again in 1834, Schley was elected as a Democrat to the United States House of Representatives. He resigned from that position to become the 36th Governor of Georgia from 1835 until 1837. During his gubernatorial term, Schley initiated the creation of the Western and Atlantic Railroad. He also advocated the establishment of a lunatic asylum and a geological survey of the state. Schley published a Digest of the English Statutes in Force in Georgia (Philadelphia, 1826). He was an ardent Democrat and strict constructionist. He died in Augusta in 1858 and was buried in that same city in the Schley family cemetery. Schley County, Georgia is named his honor. The official document is partly printed on vellum, a land grant for 40 acres in Jasper County, in the 21st district section of Cherokee County. Surveyed on July 23, 1832 by Matthew Philips. Also included is the original top of the wax seal that was used to stamp the land grant. It is framed and matted under glass. In great condition. The measurements including the frame is 14.5″W x 18.5″H. Eight times between 1805 and 1833 Georgia held lotteries to distribute land, the largest held in the United States. The original Cherokee Indian territory became Cherokee County by an Act of December 26, 1831. A law passed on December 3, 1832, and divided original Cherokee County into ten counties. Land Grant signed by Georgia Governor Charles J McDonald. Charles McDonald spent two terms as governor of Georgia during the tumultuous years following the economic panic of 1837. While in office, he helped to restore public confidence in the state’s finances and government. After his four-year tenure McDonald became an advocate for states’ rights. The official document is partly printed on vellum, a land grant for 160 acres in Cherokee County. Eight times between 1805 and 1833 Georgia held lotteries to distribute land, the largest held in the United States. The original Cherokee Indian territory became Cherokee County by an Act of December 26, 1831. A law passed on December 3, 1832, and divided original Cherokee County into ten counties. Surveyed on May 23, 1832 by Samuel Bailey. Also included is the original top of the wax seal that was used to stamp the land grant. It is framed and matted under glass. In great condition. The measurements including the frame is 16″W x 20″H. Land Grant signed by John Penn, the last Colonial Governor of Pennsylvania. John Penn was the last governor of colonial Pennsylvania, serving in that office from 1763 to 1771 and from 1773 to 1776. He was also one of the Penn family proprietors of the Province of Pennsylvania from 1771 until 1776, when the creation of the independent Commonwealth of Pennsylvania during the American Revolution removed the Penn family from power. The official document is partly printed on vellum, a land grant for 150 acres in Cumberland County. Dated October 22, 1770. Surveyed by John Lukens, Surveyor-General of Pennsylvania. It is framed and matted under glass. In great condition. The measurements including the frame is 19″W x 15″H. Land Grant signed by Virginia Governor Henry Lee. Henry Lee was an early American patriot who served as the 9th Governor of Virginia and as the Virginia Representative to the United States Congress. During the American Revolution, Lee served as a cavalry officer in the Continental Army and earned the name Light-Horse Harry. Despite his own military prowess, he is probably best known today as the father of Confederate general Robert E. Lee. The official document is partly printed on vellum, a land grant for 11,415 acres in Mason county dated on November 6, 1783. Surveyed on March 15, 1790. It is framed and matted under glass. IThe measurements including the frame is 19″W x 23.5″H. Hancock County, Georgia land warrant dated the 7th July, 1794 and surveyed the 12th 1794 for Hugh Montgomery who resides in this sate, a tract of fifty seven acres of Land bounded. Signed by Georgia Governor Peter Early. Also included is the original top of the wax seal that was used to stamp the land grant. It is framed and matted under glass. In great condition. The measurements including the frame is 14.5″W x 21.5″H. We are delighted to present 8 original and signed official paperwork from the late 1700’s and early 1800’s. These came from a serious collector’s estate. These are a wonderful investment, and are prefect for the home, office, gallery, museum, or as a gift. Peter Early served as governor of Georgia at the height of the Creek War of 1813-14. His administration’s enthusiastic backing of federal military expeditions on this “other front” of the War of 1812 enlarged and secured Georgia’s frontier by hastening the Indians’ removal, thus fostering the state’s nineteenth-century transition from an undeveloped frontier to a “cotton kingdom.” One of a generation of late-eighteenth-century Virginia emigrants who rose to prominence in Georgia public office, Early also served as a U.S. congressman, state superior court judge, and state senator. He was a longtime trustee of the state university in Athens and briefly served as its interim president. These lanterns are very-very rare as you collectors out there will agree. They are totally all original and the patina is exactly correct for the period, and totally operational if desired. Stamped by Steamdrifters Stores LTD Lowestoff. Fine Collectible! Made of solid brass and original glass. Circa 1900. Miami Sailfish Club certificate from 1932. This is for catching a 65 lb. sailfish! Too cool. Great as a collectible or an nautical decoration. Nobody else will have one like it! For your fine art collection, an original acrylic painting by Mira Paris. The title of this exquisite masterpiece is “Connoisseur Beauty”. Along with the painting is also a copy of the letter from Richard Nixon to Prince Abdul Khalid thanking the prince for a painting by Mira Paris entitled “Eagle Protecting the Flaming Earth”. This is a collectible piece of Americana as this flag was flown over the United States Capitol on December 10, 1998 at the request of the Honorable Newt Gingrich, Speaker of the House of Representatives. The size is 3 x 5 ft made of Nylon in the USA. Comes in original box with letter of confirmation. This flag was flown for the candidate of Fort Peachtree Chapter, NSDAR for the 1999 NSDAR outstanding teacher of American History John W. Bresions, American History teacher and chairman of the social studies department at Lakeside High School in DeKalb County, Georgia. Signed by Alan M. Hantman, AIA Architect of the Capitol.